The Fishing Gazette first saw the light of day in 1879 and it was the voice of British angling until it faded away after the end of the second world war. In between those dates very few controversies were not aired in its pages, very few innovations were ignored, and every major personality contributed. The breadth of the Gazette was vast; if it swam and could be caught, the Gazette was sure to publish something about it. The only shame about Geoffrey Bucknall's book is that it isn't twice the size. 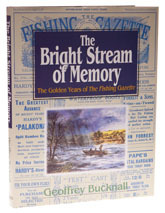 The Bright Stream of Memory makes an excellent sampler of the Gazette's glory years, and there are tales here of the rise of the dry fly, the death of Marryat and the fall of George Kelson which would be hard to find anywhere else. With bound years of the Gazette trading for £200 or more, The Bright Stream of Memory is extraordinary value for money and I can recommend it.